Running from Tuesday 14 – Sunday 19 August, Gravity & Other Myths will be a high-octane exploration of the limits of human strength. 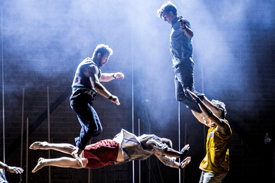 As a circus company it will journey to the edges of physical, cerebral and collective brawn in this UK premiere. Gravity & Other Myths is full of Australia’s acrobatic sensations, gaining acclaim with a series of accomplished ensemble works. The piece is full of ‘do it yourself’ aesthetic, as well as lots of trickery and distraction: this is circus that leaves no viewer unmoved. Backbone is the culmination of all that’s gone before: a celebration of human connectedness and the meaning of strength. Scottish Dance Theatre will then explore the transformative power of beauty with Velvet Petal on Friday 31 August and Saturday 1 September. As its London premiere, this intimate dance work is inspired by the life-cycle of the Monarch butterfly and Robert Mapplethorpe’s polaroids. The piece is accompanied with a fresh dance-punk score by Torben Lars Sylvest including music by LCD Soundsystem, Spoek Mathambo, and Four Tet, with a live performance by Abul Mogard. Audiences are in for a treat this month with lots of performances aside from dance on offer too. The 17 acre Southbank Centre site is full of artistic opportunities for audiences to experience and engage with art within a variety of mediums.